Kuban hats and burka overcoats are now being championed by a number of the world’s top fashion designers. These elements of dress were originally found only in the wardrobe of one segment of Russian society, albeit a very important one – the Cossacks. The world’s leading fashion designers Ralph Lauren, Simon Kneen, Manolo Blahnik, and Anastasia Romantsova are advising the fashionable to wear Kuban hats and burka overcoats – long sheepskin capes without fasteners. These elements of dress were originally found only in the wardrobe of one segment of Russian society, albeit a very important one – the Cossacks. A "free people", Cossacks served on Russia’s borders: on the Dnieper, Don, Terek, and Ural rivers. At first they did not have a national dress. Their wardrobe was made up in part of peasant clothes from runaway serfs who found refuge among the Cossacks – as they used to say, “There are no extraditions from the Don,” – and in part from replenishments taken as booty during raids and campaigns. But what is interesting is that the Cossacks never removed clothing from the slain. Even if their own garments were torn, it was a dishonorable and ignoble thing to take some new ones from a fallen soldier. The most colorful image of the Zaporozhye Cossack is his outfit of cloth trousers, a papakha (tall sheepskin hat with cloth base), smock, and kaftan (a knee-length outer garment that fastens tightly at the chest with buttons and gently flares toward the bottom. The cloth trousers were worn on top of spodniki (linen underpants). Onto the spodniki was fastened a small cloth pouch with money, held to the body along with the pants themselves with the help of a gashnika, a belt. The collarless open-breasted kaftan became part of the traditional costume of the Don and Ural Cossacks. Later in the 19th century, it transformed into a uniform kaftan which was fastened tightly with hooks and eyes. The Caucasus, Kuban and Terek Cossacks sewed cartridge belts onto the traditional kaftan with the advent of firearms (portioned charges were specifically needed by cavalrymen in battle), and as a result the legendary cherkeska (Circassian coat) came into being. It is impossible, of course, to imagine a Cossack without a hat. 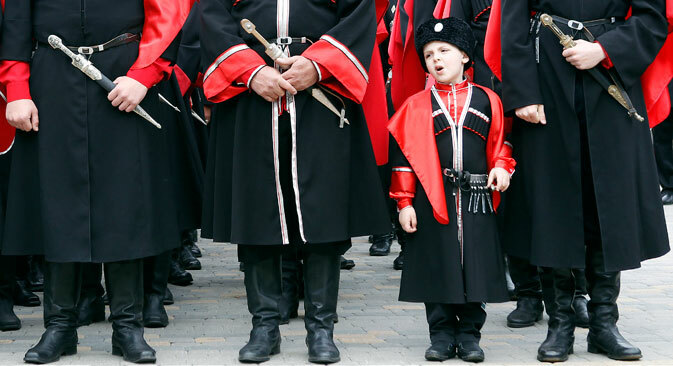 Young Cossacks removed their hats as a token of submission when they were in the presence of older Cossacks whilst serious issues were being handled. Atamans (chiefs) wore taller hats in contrast to the others. Cossacks treasured their uniforms and wore them as long as possible. This was not due to miserliness but superstition. It was out of the same motivation that they always wore their famous forelocks on the left side of the head (the head was completely shaved leaving only one long lock of hair). They believed an angel sat on the right shoulder of a person and guided him on the right path but that on the left sat a devil, who needed brushing off by the forelock. The forelock was an important element of Cossack identity and to lose it was a terrible shame: “Without a forelock, a Cossack is not a Cossack,” goes a saying. It was believed that for killing his enemies the Cossack went straight to hell when he died but that the Lord, knowing he did so out of love for his homeland, pulled him out of the furnace by that same forelock. Another important attribute of being a Cossack was the wearing of silver crescent-shaped earrings. Not everyone had the right to wear earrings. Those whom it was necessary to protect from danger by virtue of their social status were “marked” by an earring. A pierced left ear meant that the Cossack was the only son in the family and a pierced right one meant that he was the last man in his family. The earring was worn as a talisman and amulet. The crucifix was also worn and an icon was stitched into the lining of a Cossack’s hat. It was not until the mid-19th century that standard uniforms appeared among Cossack troops. The Don troops wore a chekmen (cloth kaftan), grey-blue trousers with a red stripe (width 1.5-2 inches), boots or nogovitsy, as well as a bashlyk (woolen hood), winter chekmen, and a fur hat or papakha. The Kuban troops wore a cherkeska made from dark cloth, dark trousers, a tunic, a bashlyk, a winter burka, a papakha or the truncated Kuban papakha, and boots or chabotki (low summer shoes). Today it is easy to find stores specializing in Cossack dress on the internet or in large cities - not for costumed performances but for daily wear. Cherkeskas and beshmets, bashlyks and sashes, wide trousers and papakhas can all be tailored to size and according to taste in terms of material and color in stores with poetic names like “Cossack Dawn” and “Cossack Shoppe”. Cossack women’s dress consisted of a cotton blouse and skirt. The blouse was form-fitting more often than not, but always had long sleeves and was finished with a tight row of elegant buttons, webbing, and handmade lace. Skirts were long; other lengths were considered indecent. They were made out of cotton or wool and draped at the belt for splendor. In the Kuban region, linen skirts were, as a rule, worn as “undergarments” and were called that. Petticoats wore worn under cotton, satin, and other skirts, sometimes two or three at time, one under the other. The innermost one was always white.